I am working to gradually build up this library of information about the gemstones used in my work. 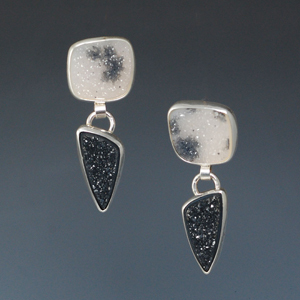 Drusys (may also be spelled "druse" or "druzy" or probably several other ways!) are like miniature geodes -- very tiny crystals have formed on the surface of another gem mineral.The crystals usually form in hollows in the rock which were created by gas bubbles (in magmatic rock), or in spaces where organic material has been washed away (in sedimentary rocks). Most of the drusys in my jewelry are in the quartz species, although I have used garnet and pyrite ones as well. The earrings pictured at left are two matched pairs of drusys, with the top pair showing an unusual dendritic pattern. Quartz drusys are frequently given a metallic coat using a process called "vapor deposition coating." 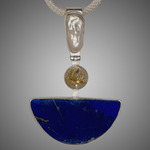 Lapis lazuli is composed of several minerals, including lazurite (which gives it the characteristic blue color), pyrite (which contributes the golden colored streaks), and calcite (the white streaks sometimes seen). The most significant deposits are found in Afghanistan, where it has been mined for over 6,000 years. The name itself derives from the Latin words for stone ("lapis") and heaven or sky ("lazuli"), so it translates to "stone of heaven" or "sky stone". Pictured at left is my pendant showcasing a half-moon shaped lapis lazuli, with rutilated quartz to complement the pyrite and a freshwater pearl to complement the calcite. It is available for purchase on this website: Blue Half Moon. Labradorite is named after Canada's Labrador peninsula, where it was initially discovered. Deposits are now found in Australia, Madagascar, Mexico, Russia, and the United States (as well as Canada). It is part of the feldspar group of gems, which includes moonstone, spectrolite and adventurine (among others). Good quality labradorite displays lustrous tints of metallic blues and greens, although it can display the full spectrum of colors. It is one of the group of "phenomenal" gemstones, meaning there is something special about the way the gemstone transmits and reflects light (such as the "play of color" seen in opals). In the case of labradorite, the effect is called labradorescence (it also known as a schiller effect), and it creates beautiful flashes of color as the gem moves. 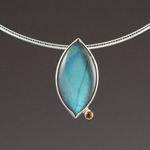 Pictured at left is a gorgeous aqua-color labradorite pendant, with a small golden citrine as an accent gem. Blister pearls grow attached to the inside of the oyster shell. The ones used in my jewelry come from the penguin oyster and are cultivated in the South China Sea. The pearls take 10 years to grow - the oyster is allowed to mature for 3 years before the bead nucleus is inserted to start the pearl, then the oyster builds up layers of nacre (the substance which makes a pearl) for another 7 years. These pearls from the penguin oyster have a wonderful lustre and a unique rainbow iridescence. 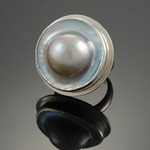 I love these pearls and use them in all jewelry forms: rings (pictured at left), pendants, earrings, bracelets. Rutilated quartz is quartz with needles of the mineral rutile running through it. The color of the rutile can range from reddish-brown to gold. Brazil is one of the primary sources of rutilated quartz, and it is also found in Australia, Pakistan, Kazakhstan and Madagascar. 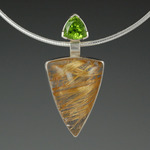 No two pieces are the same - each gemstones has its own unique pattern of rutile. PIctured at left is a custom pendant showcasing a magnificent piece of rutilated quartz, accented with a deep green peridot trillion.